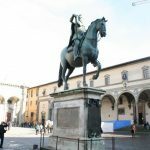 Not many of the millions of people coming to Florence Italy every year have the privilege to see Piazza Santissima Annunziata because it’s not listed in the top attractions. Florence is a place filled with hidden attractions. 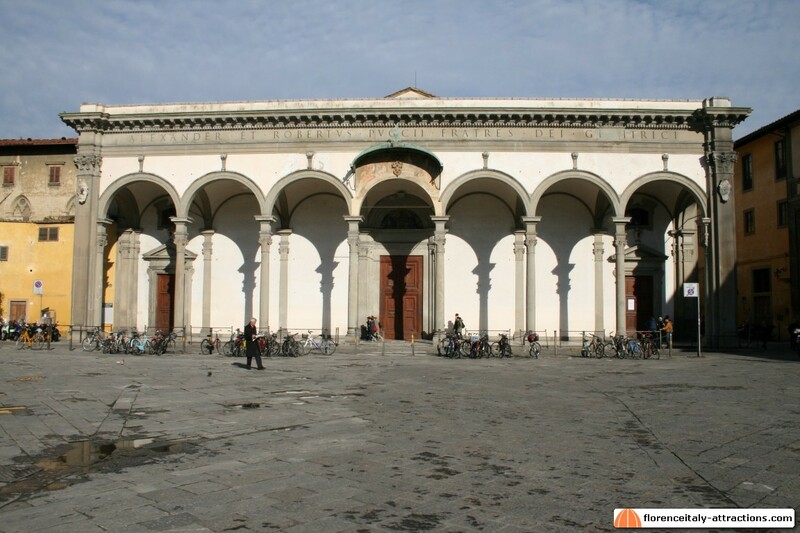 Featuring a Basilica containing amazing works of art and the tombs of many important artists of the Renaissance and the first ever renaissance architecture, this square is dense of art and history. It was in 1233 when seven knights in Florence Italy, one night, all made a dream involving the Virgin Mary. They decided to retire as hermits in a wood north of Florence, which is where, today, is Piazza Santissima Annunziata. The “Seven Saints” founded the order of the Servants of Mary, yet another religious order that added to the Franciscans, Dominicans, Augustinians, etc. In 1250, the Servants of mary started to build the Basilica of Santissima Annunziata, which is the most famous attraction in the square. The Basilica is dedicated to Mary, in particular to the Annunciation, which once was the Florentine New Year’s day (March 25th). Apart for the normal religious functions and celebrations, Piazza Santissima Annunziata comes to life in the days particularly dedicated to the Virgin: on March 25th (Annunciation), September 8th (birth of Mary) and December 8th (Immaculate Conception). In these days, there are markets and historical parades in the square. 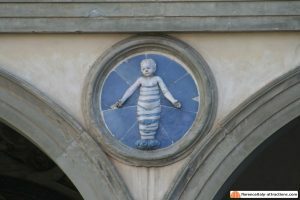 Piazza Santissima Annunziata, although dominated by the Basilica, offers many more attractions: for example, the Spedale Degli Innocenti, first public orphanage in Europe, designed by Filippo Brunelleschi in the second decade of the 15th century. The Spedale represents the first ever example of Renaissance architecture. Filippo Brunelleschi created the concept of modular architecture, taking inspiration from the classical Roman buildings and making large use of “perfect” shapes like the square and the circle, that repeat to form a perfectly symmetrical building. The Spedale, still active today, hosts a museum where you can admire works by Domenico del Ghirlandaio and a copy from Filippo Lippi by a young Sandro Botticelli, when he was an apprentice of the friar/painter. Piazza Santissima Annunziata features a bronze equestrian statue of Ferdinando I Grand Duke of Tuscany, similar to the statue of Cosimo I de Medici in Piazza Della Signoria. The statue was casted in bronze by Giambologna and Pietro Tacca in 1608. 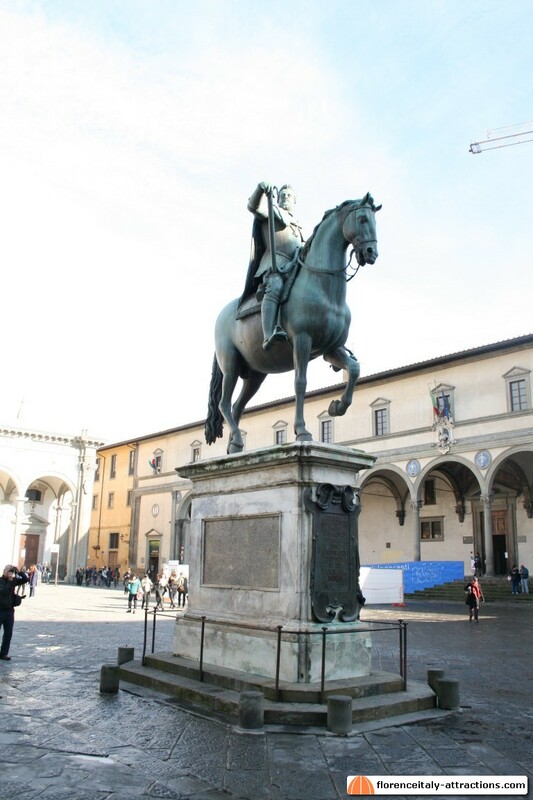 Ferdinando and his father Cosimo are the only Grand Dukes of Tuscany remembered by bronze equestrian statues, which by the way were both commissioned by Ferdinando. Along with the statue, there are two fountains by Pietro Tacca featuring marine monsters, initially destined to Livorno. The Grand Duke Ferdinando II found them so beautiful that he decided to keep them in Florence. Unfortunately, the two fountains are in bad conditions and would need works of restoration. 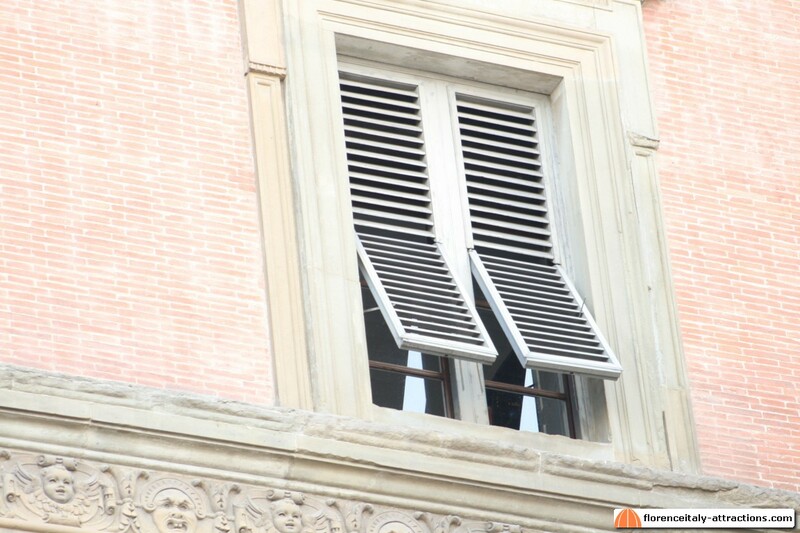 One of the windows of Palazzo Budini Gattai, on the South-West side of Piazza Santissima Annunziata, is always open. Here is the legend: back in the Middle Ages, when the palace was named Palazzo Grifoni, a beautiful young lady married a knight of the Grifoni family. Few months later, the man was recalled to the army. The woman said goodbye from the window, then spent the next months waiting for her husband, always looking at the square from that same window. After months, that became years, the woman realized that her husband would never come back, yet she spent the rest of her life looking at the world from that window. 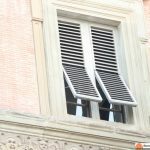 When she died in that same room, and her body was removed, someone closed the window: any object in the room started to fly and hit the walls until the window was opened again. Better not to be against a ghost, they thought… and the window is still open.